Are You Eligible for an Expunction? How Old Were You at the Time of the Charges? Have You Ever Had Another Case Expunged? Not only does it erase those records, but it allows that person to deny, or refuse to acknowledge, the existence of that previous case, without worrying about being found guilty of perjury or of giving a false statement. Of course, getting an expunction does not eliminate previous social media posts, or people’s memories, about the expunged case. Further, getting an expunction does not mean that a prospective employer or school can’t or won’t hold the old case against you. However, removing those old entries from your official records is typically very helpful. Historically, a person could only get one expunction per lifetime, and, for the most part, a person could not get a criminal conviction expunged. Instead, up until recently, a person could basically only get an expunction if the charges were dismissed, or if the person was found “not guilty”. 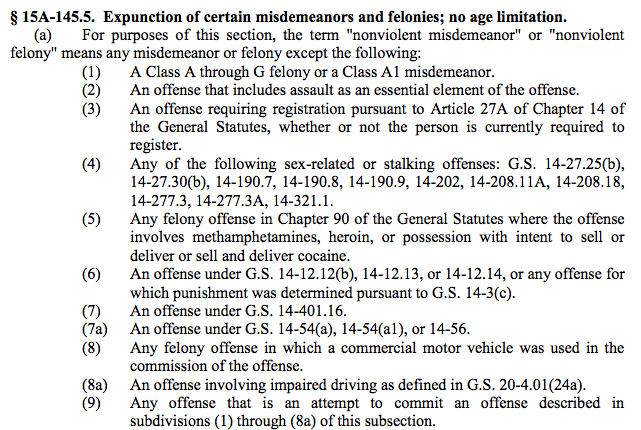 However, recently new laws have been passed that open up a number of additional possibilities for various expunctions, and, in some cases, even the expungement of convictions, depending on a number of various factors, including age at the time of offense, the type of charge involved, the outcome of case, and/or the number of years passed since the case was concluded. Further, new laws, and the strategic use of various statutory provisions, can now sometimes allow people to get multiple expunctions during their life, even in multiple counties, depending on a number of variables. The expunction process involves filing a petition and getting an initial court order, then an eligibility verification by the SBI, and then a final court order. The expunction order then forwarded to the Clerk of Court’s office, as well as various law enforcement offices, including local police or sheriff’s department and the SBI and the FBI. The process currently takes between 6-15 months from beginning to end, primarily due to understaffing at the SBI. Whether a person is eligible for an expunction can be fairly complicated and requires an attorney well-versed in all of the numerous expunctions statutes. Not all criminal defense attorneys regularly handle expunctions, so make sure that you find one that does these so that you can get maximum benefit from your expunction(s).